At this stage in the month of March, we still await the onset of spring. Despite that, I still shaved my head a little while ago, which I traditionally do at this time of year. Last year, we had completed quite a few public activities by this point. This year, I want our public activities to be a bit more measured. SCO had obtained stay order from local court to stop other private organizations to launch #3G & #4G facilities in #GilgitBaltistam to deprive us from modern technolog. "We are not even being trusted to have communications,how provision of constitutional rights can be expected. However, they do need to sharpen up their knowledge on the region. Nevertheless, we still appreciate their attention. Meanwhile, on various sectors of the LOC there has been an almost wholesale interruption of communications for the past 2 weeks. While people have much to do on their own initiative to save themselves from Indo-Pak crossfire, they also have to tolerate blocking of mobile networks which is exacerbating their misery whilst damaging their livelihood too. This is a portrait of the late great K. H. Khursheed. Hand-drawn by Babar of Gujranwala (Pakistan), while a Fine Arts Student at Punjab University - Lahore in 1990. Playing catch-up with the past while consuming anything that resembles the future. There's been heavy firing between our neighbours in our territory yet again. Reports of 2 dead and 3 injured surfacing so far. From starting this blog on May the 29th 2008 till the 31st of December 2017 elapsed 3,502 days; during which I posted only 149 times. That gives us an accumulated average of 4.3%. Does a jump from less than 5% in almost a decade to a swing of almost 90% in just over a year signify anything? First of all, that I spent a lot of time in the field, on the ground or what I would like to describe as public space. Research and activism outside with our people leaves very little time to organise and categorise data collected. How much I'll be able to accomplish doing is difficult to say. If I can somehow distinguish between what needs to be online and what can remain offline, that would help others complete anything that remains. I have tried to link all my publicly accessible work here on this blog and am working hard to ensure that all information is up to date before I publish Public Opinion Survey Report 2.0 . We all have much to juggle in life. I hope I can make as many useful choices in public interest as possible. I only became aware of this conversation today. On its panel, it had a UK citizen moderating accompanied by one citizen of each of the following countries: India, Jammu & Kashmir and Pakistan. At around 40 minutes into the video, is perhaps the most notable part of the discussion wherein the Jammu & Kashmir representative talks about resolution as a set of processes, which include awkward but important aspects such as narrative bridging. I'm heartened that my thinking on the ground here is echoing somewhat in the academic corridors of London. I've never met her or even directly communicated with her, which makes me appreciate her analysis all the more. 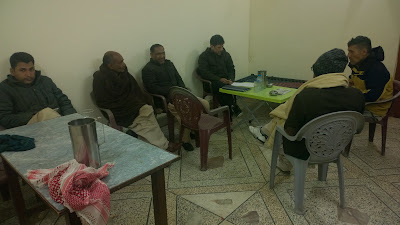 People from #AzadKashmir denied medicines in the Pakistani hospitals. Growing discrimination with #AJK. I am trying to remain relevant on FB, at least once a week, if not more. In AJK we are only free to praise Pakistan and curse India with Islamic platitudes. There is zero space for any other narrative. There are very few who promote any other narrative. War is always funded, peace is not. AJK me hum sirf is had tak azaad hain ke hum Pakistan ki tareef kar sakey aur India par lanat bhejh sakey, apna Islami farz samajh kar. Kisi aur bayaaniya ki gunjaish nahi hay. Bahut kam log hain jo kisi aur bayaaniya ki amli hamayat kartey hain. Wasail hamesha jang ke liye dastayab hain, aman ke liye nahi. A quiet day has followed a quiet evening on the LOC, it seems. 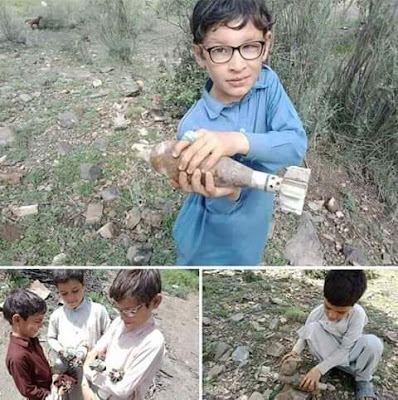 These are photos taken earlier today in Poonch Sector along the LOC and what these children perceive as toys are war implements fired from the Indian-controlled side of the LOC yesterday. The war in our territory hasn't quite ceased. Sharafat Hussain s/o Abdul Qayoom, 32 years of age hailing from the village of Chahi in Darra Sher Khan was shot in the head from Indian cross fire. He was taken in a critical condition to DHQ Kotli from where he was referred to Rawalpindi in Pakistan. Locals believe he was targetted. Battal, Gohi, Darra Sher Khan, Serra and Mandhol are witnessing incessant cross-fire. 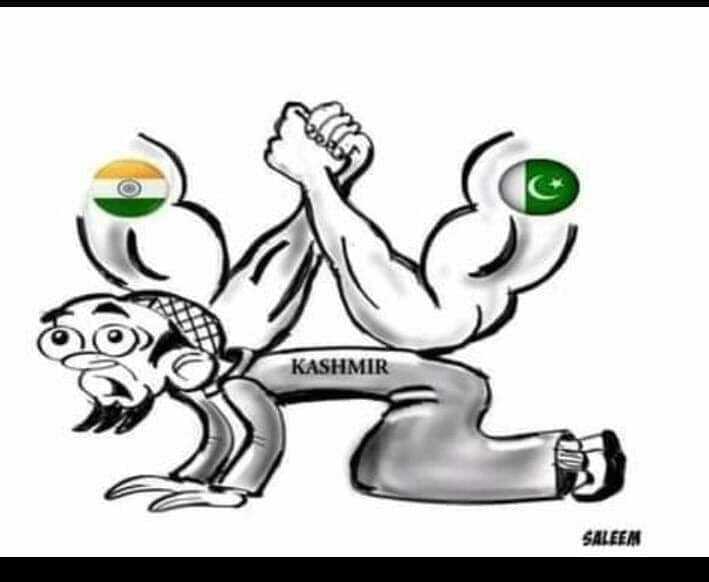 The solution of the Kashmir issue can only be arrived at through dialogue & consensus and if we were to invite somebody to come and fight our war, we would only be damaging ourselves. Remember that the war just requires constant struggle and (meaningful) discussion because we are a dignified and independent nation (from a historical perspective). The article referenced above ends with a very appropriate couplet. Now, on the surface the above tweet sounds magnanimous but let's not forget what happened to Shahid Afridi when he spoke in favour of Kashmir's independence, barely 3 months ago. 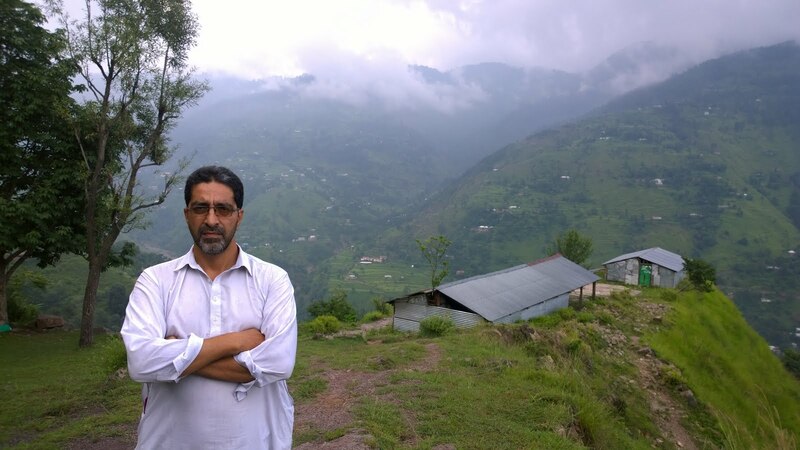 Tariq Farooq, a senior minister in the AJK government, concurred with that view. "Anybody can do anything, claim anything, discuss anything in this area. 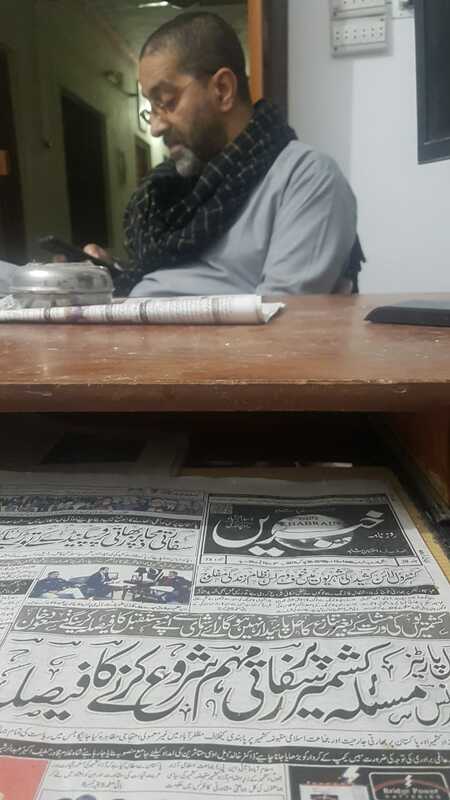 In our government, everybody has full fundamental rights to speak anything which is related with human rights," he told Al Jazeera in the AJK capital, Muzaffarabad. Asked if that freedom extended to parties advocating for Pakistani forces to leave Kashmir, he said: "They can't say that". Many thanks for giving some attention to AJK. I would strongly suggest doing a similar piece on Gilgit Baltistan, if possible. Ultimately, ditto for Jammu & Ladakh too. In that way, a global reader can get a rough idea of the various internal public narratives existing in the erstwhile princely State of Jammu & Kashmir. Its been a wet and cold day today. Enough chill to quieten the guns of our neighbours it seems. The day after a night of rage, costing us innocent lives and much else yet again. 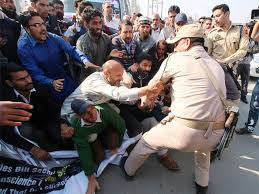 12 Members of JKSLF and JKNSF were arrested outside Islamabad Press Club for protesting against cross LOC killings in their (own) territory (of J & K) and detained at Margalla (Some reports cite Kohsar) Police Station. Amongst those detained were Sardar Talha, Waqas Manzoor and Irfan Qayoom. Baba Jaan has been a prisoner of conscience for almost 8 years now. Citizens of AJK have been prevented from meeting him, despite travelling over 24 hours to reach his prison. Yet, when he wants to say something in solidarity with Pakistan over their 'war' with India, local media is facilitated to interview him in custody. The Pakistani flag and patriotic musical theme which drowns out the words of Baba Jaan and his interviewer is what sickens me in particular. Fight peacefully for the genuine rights of your people and they declare you a traitor to their country, for trying to disrupt Chinese business with Pakistan (via Gilgit Baltistan). This while they describe your land to the world as a disputed territory waiting for a plebiscite to ascertain the local people's will. They then lock you and other peaceful protestors up, sentencing you to 40 years in prison for your genuine patriotism (to your own land). However, even if you pretend to show solidarity with them, they remove all obstacles in your path. You can be as corrupt as you want, as long as you tow the Pakistani narrative. I would consider this tactic to be a major reason for Pakistan's failure as a nation State. Not least because merit has no space in such system of governance, whereas hypocrisy has all the space it needs to flourish. - Heavy exchange of fire here too. - According to AJK Information Minister Mushtaq Minhas, 8 people have been killed and 20 injured along the LOC in AJK. DHQ (District Headquarters Hospital) Kotli is appealing for blood donors. Locals are hearing sounds of heavy fire, such that they've never heard before. - Meanwhile, it appears that there is an unusual lapse in media coverage tonight, which can easily be described as the heaviest round of fighting since the current version of this un-necessary conflict began. Heavy shelling continues in tehsil Nikyaal and Tattapani. Civilian casualties are being brought to DHQ Kotli. It is reported that 300 people comprising of 60 households have left their homes in Mankote. - It is reported that the Pakistani army checkpost in Battal is preventing locals from leaving the area. Apparently, they had been given an opportunity to leave earlier but - according to the Pakistani army - now they had to stay put. Whilst firing has been almost continuous throught the night from the working boundary (in Jammu) to Kel in Neelam, it appeared most damaging in Kotli. According to DC Badar Munir, 58 individuals (mostly women and children) have arrived from areas around the LOC near Chakothi. They are staying with their relatives but the AJK administration is providing them mattresses and other necessary items, we are led to understand. Temporary camps have been erected at the AJK University campus here to accomodate those fleeing from the Line of Control. An eye-witness of the camps explains that 360 people have been adjusted in 3 classrooms. They consist of women and children but each sack-like blanket provided has to be shared between 6 people. The AJK administration explains that it is short of funds (isn't that forever the refrain?). So, it has taken me many hours of combing through data over the past couple of days, to establish a set of events that give us some idea of the damage done to us, as opposed to the damage India and Pakistan inflict on each other in our territory. Despite that, we still lack detail and accuracy. 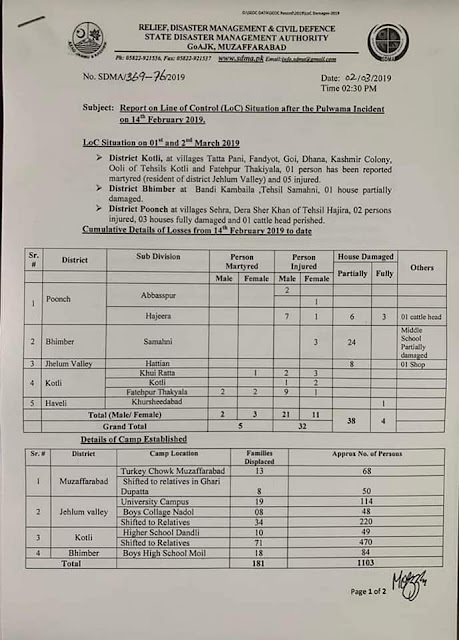 We have discussed data collection of casualties by local correspondents in each tehsil (subdivision) adjoining the LOC, on a number of occasions. However, as our people have been trained to be reactive rather than proactive over the decades - if not centuries - we are always more likely to witness ad hoc behaviour rather than a consistent institution-building process here. iv) Damages - property, livestock etc. If we - as civil society in AJK - were to accurately collect such details within 24 hours, it would assist us in making our own government accountable and by extension India and Pakistan. Whenever such an emergency situation arises, the AJK government never seems to have any contingency in place. Zero planning and preparation are always apparent. Those who fall ill are always handed prescriptions rather than medicine. The government of AJK begins urging its own citizens to appeal to the world for help. Various NGOs are contacted too, in an effort to shift the responsibilities that local politicians are mandated for. All this in a territory that is abundant with naural resources but where the government - in normalcy - makes a point of avoiding issues of governance, research, planning, merit and accountability. In such emergency conditions, the public is more or less expected to fend for itself in all matters. 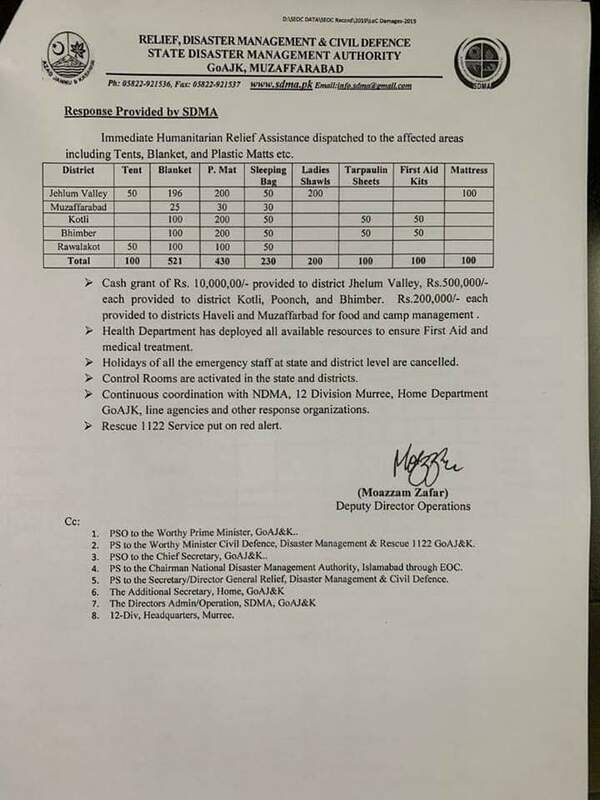 Protection from Indo-Pak crossfire (in 72 years of an intermittent conflict, there are still barely any bunkers of note in the whole of AJK), livelihood, food, shelter, transport, medical treatment etc. etc. Some of our people, when escaping from war have to travel by foot while carrying their infants and elderly on their shoulders. Sometimes, during the middle of the night where it might take them hours to reach the nearest urban centre. In such conditions, many people don't even bother approaching the government because they are convinced that the latter won't do anything for them anyway. Many of these areas near the LOC in AJK have very little or no means of electronic communication in normalcy. In wartime - such as now - even that is invariably blocked. At times without notice. for example, while the person is making a frantic emergency call to relatives to help. The role of the UN, which is obviously the largest humanitarian organisation in the world, is also minimal in this region and remains confined to UNMOGIP (United Nations Military Observer Group on India and Pakistan), which in itself has a very narrow set of duties that limit them from interaction with locals. We're still waiting for India and Pakistan to comprehensively defeat each other.....then we can get back to resuming some serious work for peace. We have suffered further casualties in AJK, yesterday and possibly more today. I'm still waiting for confirmation of details. 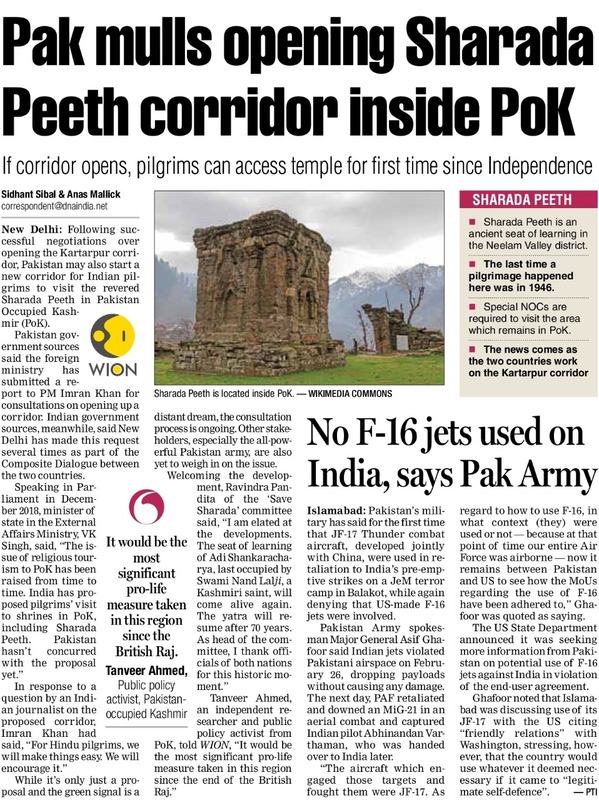 According to Shekhar's information, the Indians are adamant that only 1 of their MiG-21s was shot down - not 2 - while they are also certain that a Pakistani F-16 was downed by an Indian MiG-21, which fell on the Pakistani controlled side they say. This doesn't tally with the MiG-21 that fell in Budgaam but it could help us in identifying the other pilot, which after all could've been the Pakistani F-16 pilot. Later, his name has even emerged as WC Shahzad. However, Mr. Gupta was spot-on about military secrecy becoming a remnant of the past, in this digital age. However, we now have the increasing dilemma of countering fake or misleading news. The sound of heavy shelling can be heard from the direction of Hajeera, for the past 3 hours. Tattapani: 23 yeard old Asjad Akbar of Dhana has been injured from incessant cross-LOC firing/shelling. - Cross-firing and mortar shelling in Kotli and Khuiratta too. Near Kot - Old Eidgaah, a missile has hit a house where 3 people are feared dead and a further 2 injured. Heavy artillery is being used. - 1 of them is thought to be 80 year old Nazir Ahmed of Dheri, Nikyaal. - Indian mortar shells have reached Nikyaal bazaar in the past hour. One shell landed just near a petrol pump, windows in buildings have shattered too. - The areas of Dabsi, Lanjot, Mohra, Dheri Dathote, Palaani, Peer Kalanjar and Tarkhundi are directly in the line of fire. - It is reported that an Indian missile hit Paraawa Chowk in the centre of Nikyaal bazaar where 19 year old Sudheer Qureshi s/o Sai Qureshi of Hattian Bala was killed on the spot. - It has been reported that 3 civilians of the same family in Solatri village near Chakkan Da Bagh in Poonch district have been killed. - Other reports indicate heavy cross-fire and shelling over the past hour near Tithrinote, Tattapani, Nikyaal, Kotli, Khuiratta, Hajeera, Neza Peer, Chowki and Smaahni. - 7 people reported dead and over 25 seriously injured. - 4 killed and 27 injured in various locations in Poonch, Battal, Tattapani, Thithrinote, Darra Sher Khan, Nikyaal and Abbaspur. Heavy cross-fire reported from here too.